En el casco antiguo de Alicante se emplaza la Taberna Ibérica, un restaurante donde podrás degustar tapas, montaditos y arroces típicos de la región. Su carta variada te acerca a la gastronomía mediterránea y española, que no te dejará indiferente. Disfruta de la buena comida tradicional y un ambiente acogedor en la Taberna Ibérica. Great food, great service. Lovely place. Small nad burn Rice in paella. It was first nad last Time. We had a double 40th Birthday celebration there were 13 of us and we were looked after really well. The food and atmosphere of the restaurant could not have been better. Thank you to all at the restaurant for a great evening. A lovely restaurant with friendly staff and great food served at a leisurely pace. Fourth visit to his wonderful restaurant. I will recommend it to all my friends should they ever visit Alicante. An oasis just off the beaten track but still very central. Great place, great food and great service. Attentive staff, authentic food but could have done with a few more menu choices. Great food, great service. Excellent in every respect. We went here while on holiday, for our Christmas day meal. The food was much more than we expected and was all cooked perfectly. It was all very wholesome and the price was excellent. The waitress spike excellent English and was very friendly and warm. Thank you for making our Christmas special. Terrific Christmas lunch. Great food, well presented and beautiful presentation and service in a rustic setting in the old town. Old school all the way. Loved it! Fabulous evening. A warm welcome and attentive service. Decent choices on the menu and great value for money. Well cooked, tasty food nicely presented. The restaurant is about 5 minutes walk uphill from the cathedral in the old part of town. Good food and lovely music, a great experience ! Initial disappointment with menu choice but once that had been clarified by the helpful waiter, an excellent lunch. 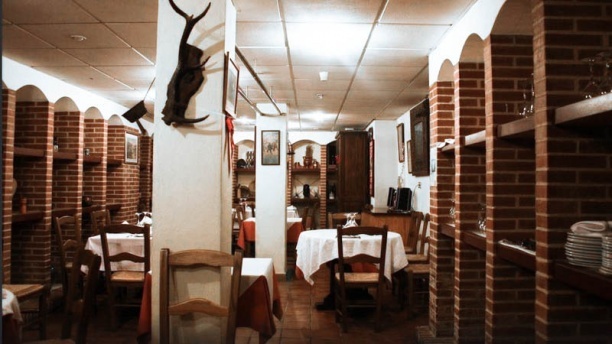 Excellent authentic Spanish food in this homely restaurant found in the back streets of Alicante old town. The paella was perfect and the talented Spanish guitar players added up to a great experience. Highly recommended.